I live with constant foot pain, kind of plantar fasciitis on steroids (congenital abnormality in my feet, possibly related to my hip dysplasia). All very boring. Nights are the worst, and foot pain and sort of 'antsy' cramping frequently disrupts my sleep. I accidentally discovered a few weeks ago that putting a heavy weight on my feet dampens down the pain a great deal, and allows much better sleep. So these might help you too, if you have foot cramping, aches, neuropathic pain, or plantar fasciitis. If you're not sure if weighted socks will help you, do a test using a large ziplock bag of sand or a large unopened packet of rice. Drape it over your foot, and see if it feels nice. Put a pack of rice in a pillow case, and put it on your feet at night. Does it help? At first I made a small weighted foot blanket. This was OK, but did tend to slip off. You could make a bed-width narrow weighted blanket though, that would probably work moderately well. There is a good tutorial here. They make such a difference to me, that I thought I should share this idea with you, in case it helps you too! The best weights I found were small steel balls. You could use ball bearings, but they're pretty expensive. 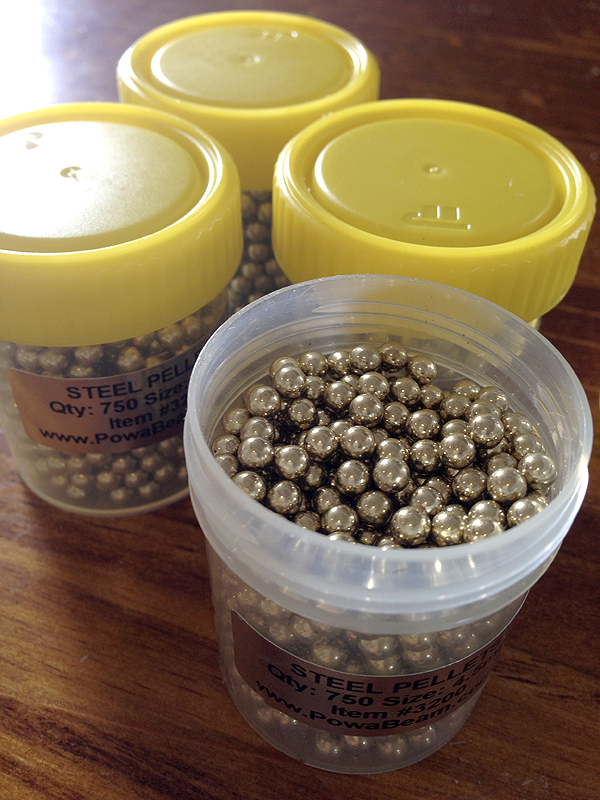 I settled on slingshot steel pellets, which cost me $45 AUD for 1 kg of shot. DO NOT USE LEAD. No level of lead exposure is safe, and wrapping it in plastic or fabric won't be enough protection. Gold's a safe option, though! 1. Put one sock on your foot, then the second sock over the top of it, lining up the toes and heels. 2. Using chalk, draw around the edge of your foot, for where you want the weights to go to. If you have a lot of arch pain, for instance, you might like it higher on that side. Also draw lines across the sole to divide the area into 4 roughly even strips. You may like to add a vertical line down halfway, too. I just did this division for the top half of my socks. Basically, the filling is going to shift around, and the pocket divisions help hold it in place. 3. Using either pins or safety pins, carefully pin the socks together in a few places (heel, toe, each side). Don't pin your foot! 4. Take off the socks. Put the darning mushroom inside the doubled socks, and sew around the outer border of the chalked line. Start at one side of the heel end, sew down a side, around the toe, and up the other side, removing pins as you go. Leave the back of the heel area open. I used herringbone stitch, which is a great stretch stitch. 5. Weigh your filler material. I had 1 kg of pellets, and two socks to make, each with 4 sections (2x4=8) so I used 1,000g/8 = 125 g for each section. Weigh out the amount (whatever you calculate yours to be), into a small measuring cup or bowl. If you only have heel pain, then just make pockets for the heel region — adapt as necessary! 6. Carefully unfold / open up the gap between the inner and outer socks to reveal the heel opening into the pocket you've just sewn. Carefully pour in your first lot of filler. A funnel can help, or something with a spout. 7. 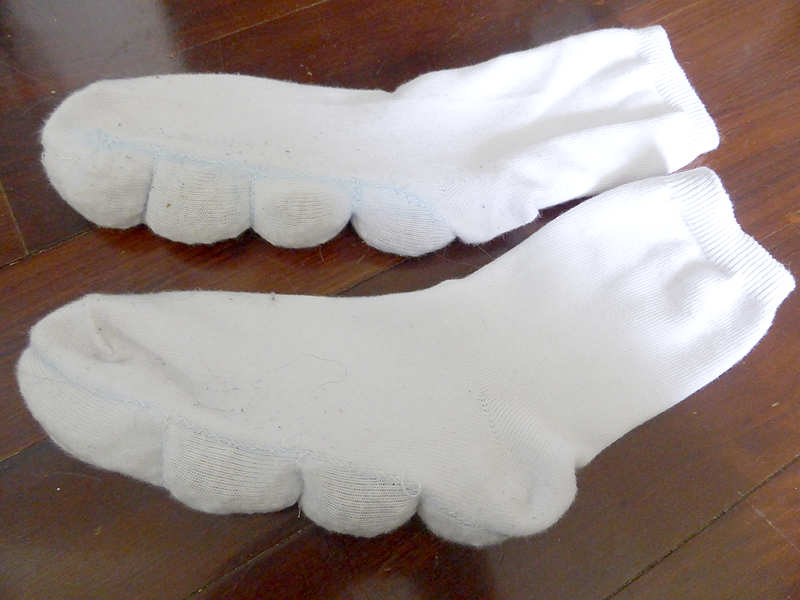 Fold back the socks as they were, shake down the filler to the toe of the sock, and put in the darning mushroom again. 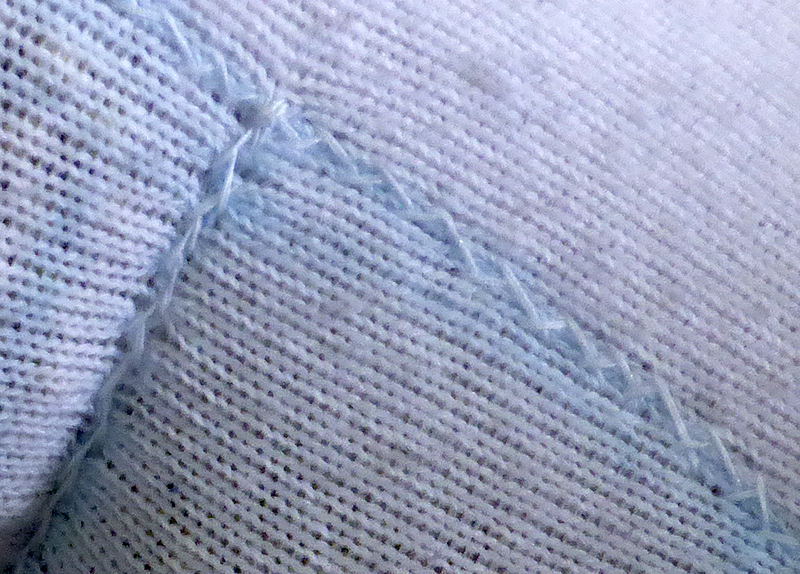 Using herringbone stitch (or another stretch stitch), hand sew across the first horizontal line, sealing in the toe section of weighted filler. 8. Repeat this procedure until all the other sections have been filled, then sew the heel opening closed. 9. Distribute the filling as you like across the sole of the foot, and sew the vertical divider line, if you so desire. 10. Make the second sock! Rejoice! Obviously these are not designed to be walked in! You may look like some weird alien footed beast — totally worth it! Plus it's an emergency cosh if you ever need to whack someone over the head while in bed ... Hang on, just a minute (fumble to remove sock), OK, now hold still while I hit you over the head! It would not totally work. Less heavy but cheaper options are sand or a fine gravel. You would need to enclose sand in a plasticised fabric (PVC, oilcloth, heavy plastic bag etc), to ensure it doesn't leak out. Plastic pellets are used often for weighted blankets, as they're washable. They aren't as heavy as the metal balls, though. Warning: Do not trim back the top sock layer! I tried this on my first pair, to reduce fabric bulk, and it meant the sock no longer had the strength to hold the heavy weighted sole on my foot. I had to remove the pellets, and throw out the socks. You need both layers of the doubled sock to hold the thing in place. Jejune, you are brilliant! You've invented a fantastic solution to Restless Legs Syndrome (RLS), a very common ailment that no one can figure out. I just stumbled onto the idea of weighted socks after years of suffering with bad RLS. Your post here is so excellent, I hope you can add some tags (RLS treatment, restless legs solution, etc.) so others can find this when searching for help. Thank you so much, and I hope your legs still sleep happily! Thank you! :) I will edit the tags accordingly.